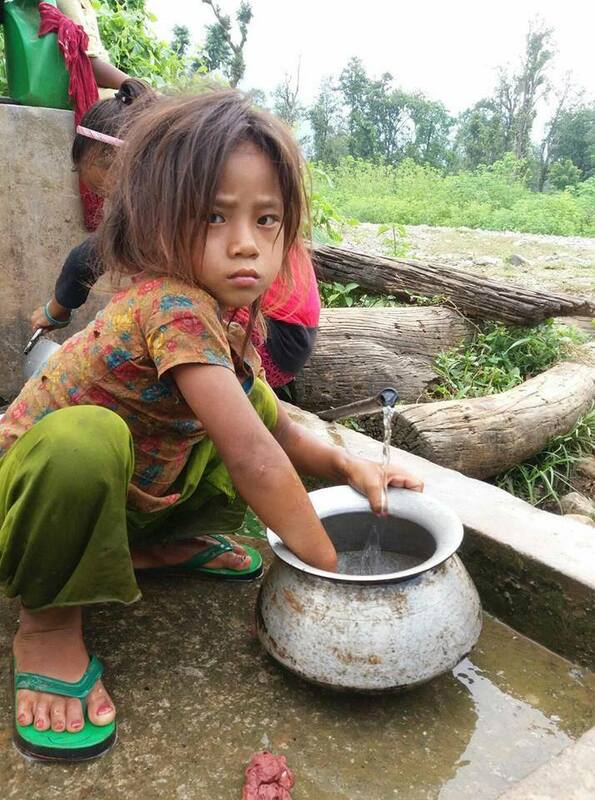 As I was washing my hands and feet in one of the community taps of the Dahakhani village, I saw a 4-year-old girl walking with a Jerry can and a rice pot in her hand. When she got near me, I tried to ask her name, but before I could say something, she got so frightened that she ran to hide herself behind the tap stand. I tried to call her few times but she was not willing to show herself. Her friends who were there at the moment explained she has an overwhelming shyness and a fear of strangers. I realized I should step back and let her do own thing. She was peeking from the sides of the wall and saw me walking away from the tap. That's when she came forward but still had a scared look on her face. I stood there and watched her filling her Jerry can. After she filled her can, she sat to wash her rice pot. The pot had a dark stain and a burnt rice stuck at the bottom which she was trying hard to clean out. Other kids were yelling at her to scrub it clean or else she was going to be smacked by her mother, but her small hands could hardly remove those dark spots. She scrubbed it for few minutes and rinsed it with water. As she was ready to leave, I saw some stains and burnt rice still stuck inside her pot. I couldn't just stand there and watch, so I asked if I could help her wash it. She quietly handed the pot to me with a puzzled stare. I somehow managed to wash the stains off of the pot and gave it to her so that her mom wouldn’t be mad. She took the pot with a gentle smile and thanked me in a low voice. I helped her put the Jerry can on her back which she was struggling to lift, and then she made her way towards her home. A girl who was shy and hid herself a few minutes ago was now feeling comfortable as I showed compassion towards her. I guess this is what "LOVE COVERS ALL" is all about, one of the most important thing that Wine To Water believes in, and now that the new tap-stand is being constructed near her house, she and her family won't have to walk for water anymore. Thank you, Wine To Water.